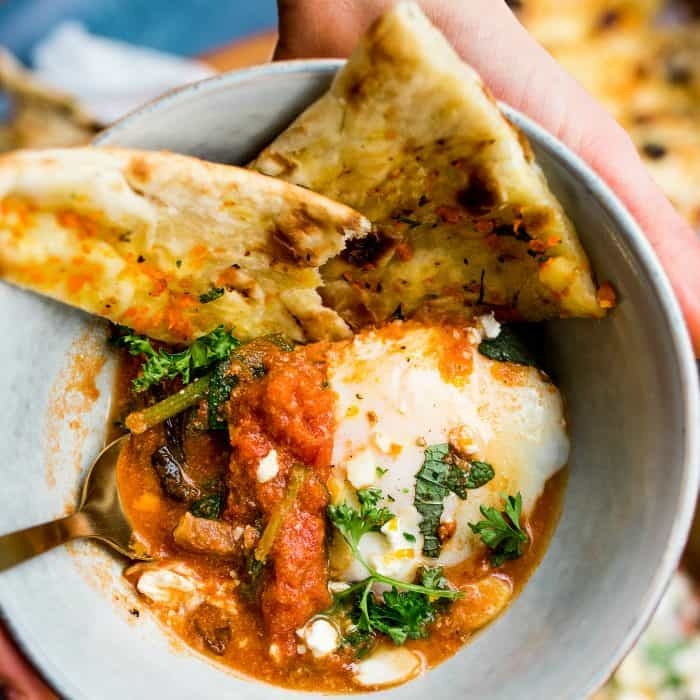 Eggs Poached in Tomato (Shakshuka) is a poached egg recipe with whole tomatoes,veggies, spices and orange zest! 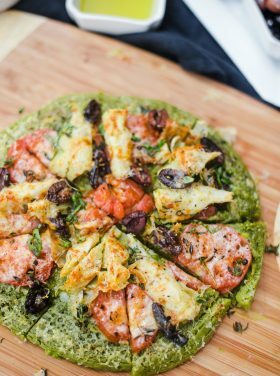 Top with almonds, feta cheese, and parsley. 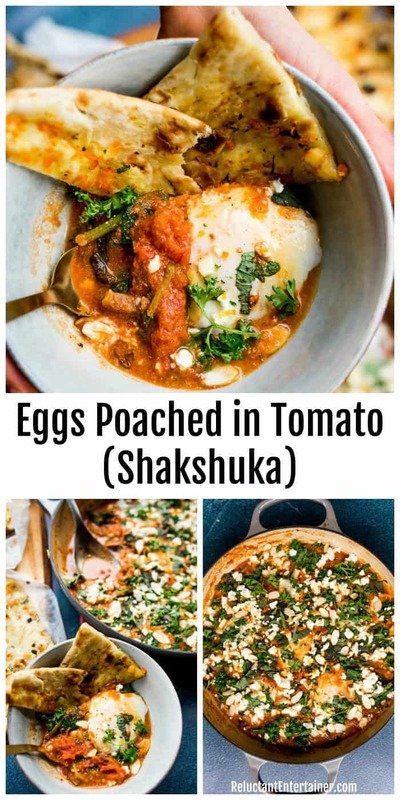 Friends, enjoy this simple breakfast or brunch recipe today, Eggs Poached in Tomato (Shakshuka). It’s actually a delicious vegetarian dinner, too! 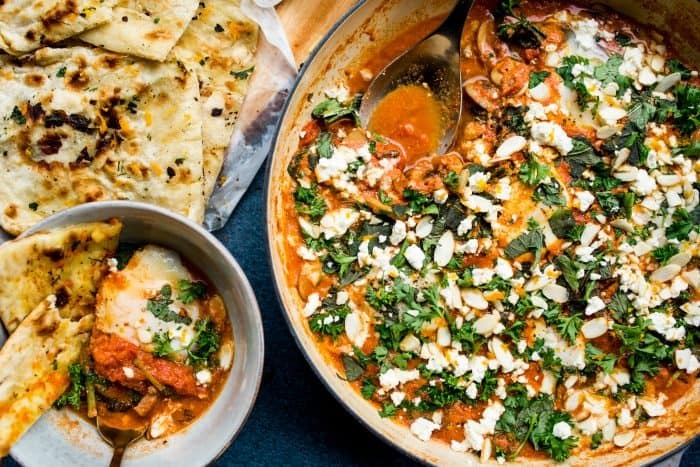 But first, what is Shakshuka? 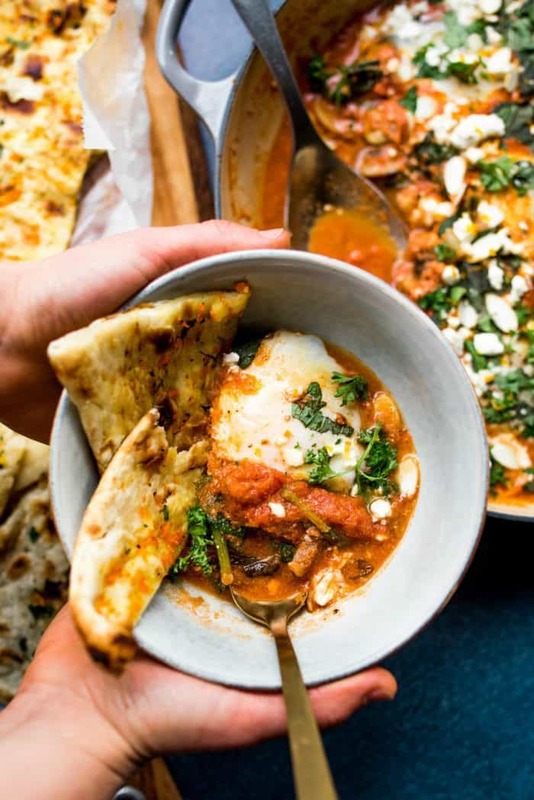 Shakshuka is a traditional shakshuka recipe is basically eggs poached in a green pepper mixture with onions, and spices popular across the Middle East and North Africa. 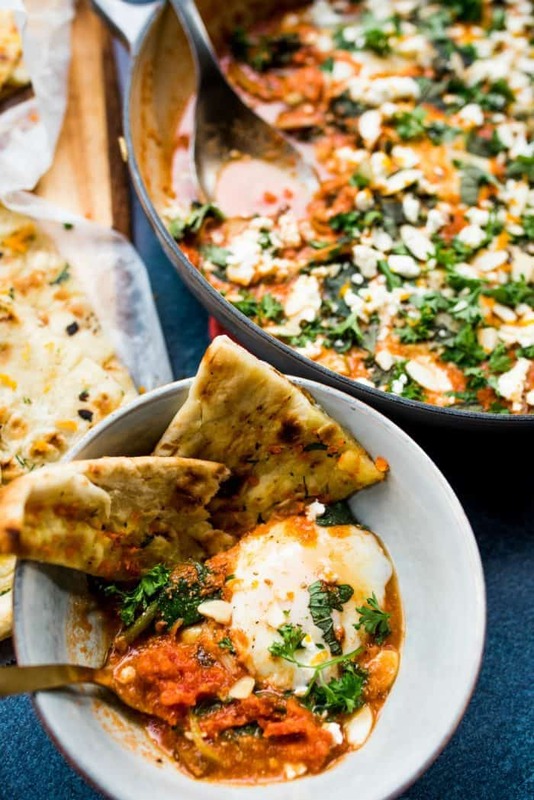 It is traditionally served as breakfast with warm pita bread or challah. But we love it for dinner with a couple more sides for a light vegetarian meal. 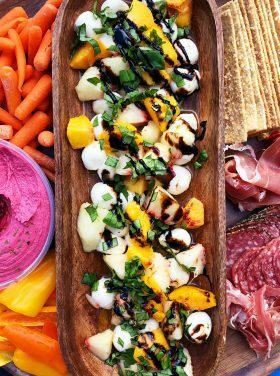 You can serve these salads: Fresh Israeli Quinoa Chopped Salad, Cucumber and Chickpea Salad, or Mint Lemon Hummus. Not only are these poached eggs heaty and filling, but so flavorful because of all the herbs and acids involved. My favorite flavors come from the orange zest and basil. 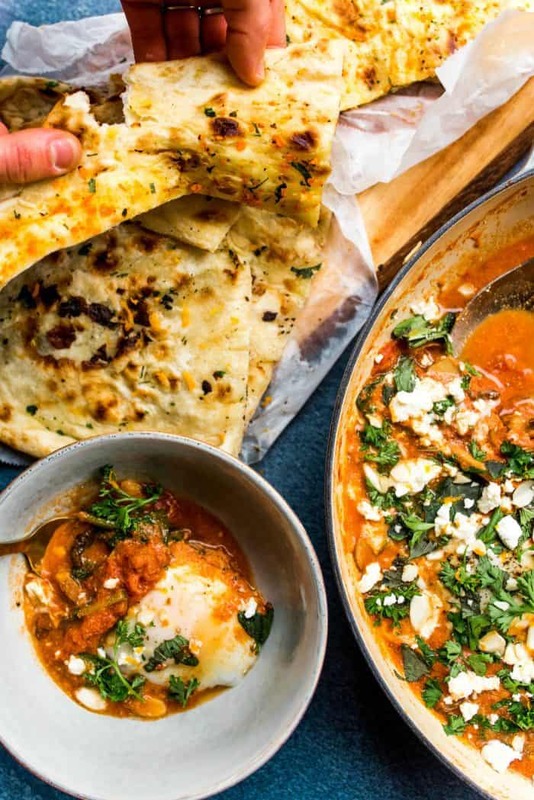 You can order fresh naan to get the full flavor experience, but Trader Joe’s has some delicious options as well. Using a spoon, create an indent in sauce (or water) for eggs—spread the indents out evenly. Crack an egg into each indent and cover the skillet. Cook about about 5 minutes, or until eggs are set (I prefer a soft, runny yolk, but if you don’t, increase the time the eggs poach). 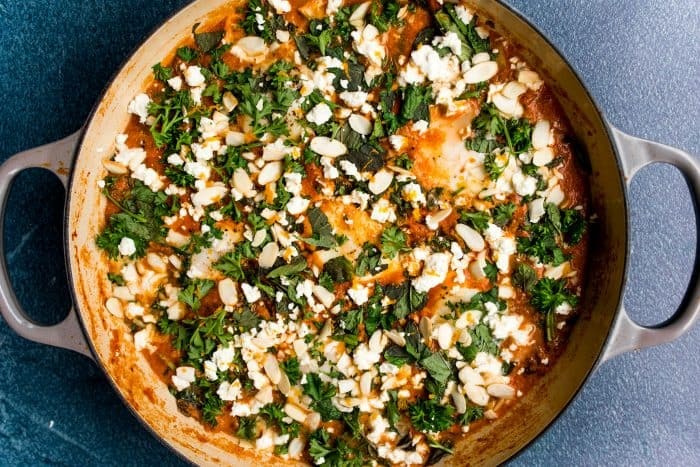 Using a spoon, baste the eggs with tomato sauce, then sprinkle with fresh parsley, feta cheese, and shaved almonds. Finish with a sprinkle of orange zest, and serve hot with fresh pita! 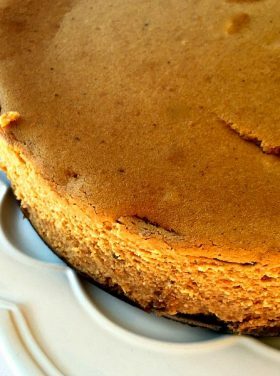 A little off track from food here today, I’ve been a little disturbed by something my husband wrote on Facebook recently. It’s powerful, so I wanted to share it here today. I heard something ominous this week at an educator’s conference, how a growing list of childhood disorders are the result of parents who no longer stare into their baby’s faces the way we used to. A baby’s face is humanity’s television, or it used to be. Because babies just don’t look at you. They hunger for your face. They need it so much they caress it. They need it to develop emotions, I heard, and the ability to discern emotions in others. What has brought our babies such newfound need? Parents are staring at their cellphones, spellbound, more than gazing at their children. We are starving babies from what they need, like breast milk. From our faces, and with them love and affection. From eye-time, where humanity travels from older eyes to new ones like warm beams, forming and blessing them. We grow children through our faces, it turns out, like sun unto seed. We’re giving this gift to glowing rectangles instead. Smart phones. Our new cigarettes. Dangerous for us and now our babies. We’re being hoodwinked, used somehow. I also think it’s sad that we live in a society where someone writes something on social media about slowing down, and others chime in about one good deed they did that day. Like … I put away my phone and played a game with my child. Or, I did this random act of kindness for this person, and helped them. Don’t get me wrong, it’s good to do these things, but to feel we need a pat on the back for something we should be doing all along, consistently, it just troubles my soul. Do we really need to remind ourselves every day to put our phones down, to connect with others, that our success is measured by social media numbers or our to-do list? Look into your loved ones’ faces! Take a book with you when you run errands, and sit in the warm car (sunshine!!) and read. Start reading a new book! I am currently reading The Art of Gathering: How We Meet and Why It Matters. So good – it’s our human-to-human links that make the most meaningful moments of our lives. Listen to music. I know, my kids are super musical, but I can’t get enough violin, so I turn on a Joshua Bell Pandora station all the time. By all means, put the phone down if you are a young mama. Reading what Paul wrote isn’t a scare tactic, it’s reality. Thanks for listening, Friends! Happy Tuesday! 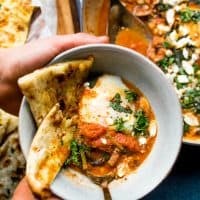 More recipes: Homemade Shakshuka with Parmesan Polenta (Will Cook for Smiles) and Fall inspired Instant Pot Shakshuka [Rachel Cooks]. 1 28 oz can of whole peeled tomatoes. We love Tuttoroso tomatoes. In a large skillet, coat the bottom with olive oil on medium-high heat. When hot, add mushrooms, and sauté until they release their liquid, and brown. Next, add in tomatoes, and reduce heat to medium-low. Add in spices, orange juice, and salt and pepper to taste. Allow tomatoes to simmer for 20-25 minutes. When the sauce has reduced, mix in spinach, yogurt, and fresh basil—about 3 minutes. 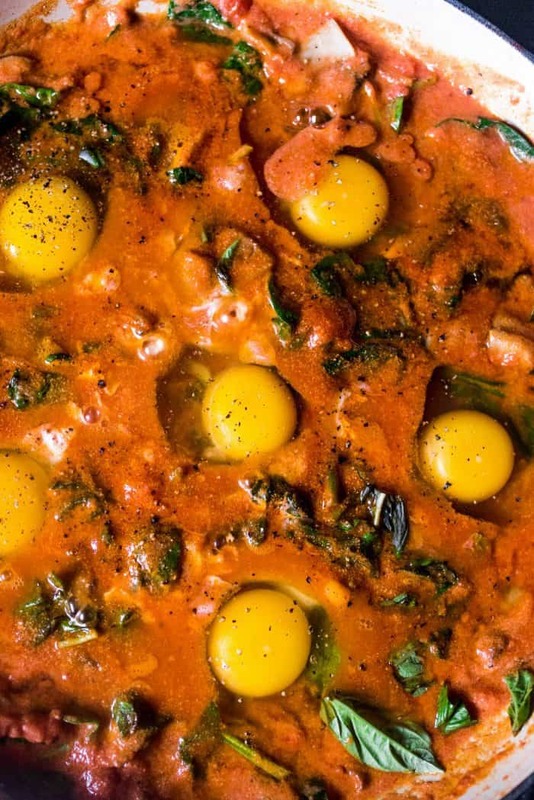 Using a spoon, create an indent in sauce for eggs—spread the indents out evenly. Crack an egg into each indent and cover the skillet. Cook about 5 minutes, or until eggs are set (I prefer a soft runny yolk, but if you don’t, increase the time the eggs poach). 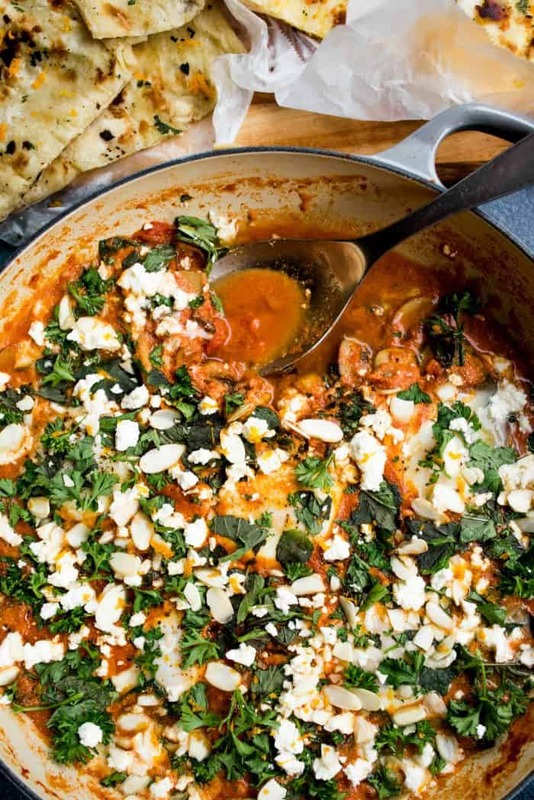 Using a spoon, baste the eggs with tomato sauce, then sprinkle with fresh parsley, feta cheese, and shaved almonds. Finish with a sprinkle of orange zest and serve hot with fresh pita! I hear you when you talk about cell phones!we see it every day no contact unless they have phone along 2 minutes before checking phone,I only use mine in an emergency,people tell me my purse is ringing lol. Thanks for recipes and all. I love this! For the last couple of years I e made a version of Shakshuka sauce with my garden tomatoes rather than the regular pasta sauce I usually make. It’s such an easy “go to” dinner! Just open a jar, add some fresh ingredients and some eggs from “the girls” and dinner is on the table! I can’t wait to try your version Sandy! Yum!